your Luxe Experience on The Knot! Luxe Linens has a great team of staff that took care of all my bridal shower and wedding linens, napkins, chair rentals, charger plates! Shelby was my stylist who helped my dream come to life, she was so kind and did everything she could to make everything perfect! Luxe was always on time for set up and delivery and delivered exactly what I ordered and everything came in pristine condition!! So happy I chose them for my bridal shower and wedding needs! Luxe Event Linen made a significant contribution to the beauty of our ceremony and reception space. They suggested decorative overlay cloths for specific tables, great color choices, beautiful ceremony and reception chairs. Shelby was a delight to work with and very professional. They know their stuff! We could not have been more pleased with our service and design help from LUXE Event Linens. The drop off and collection of the rented linens/glassware by the company to our venue were seamless. Shelby did an amazing job helping us choose stunning linens that perfectly complimented our venue and helped us realize our wedding vision. I would highly recommend LUXE for any rental needs. I cannot say enough amazing things about Colleen. Her vision and customer service are unlike any other!! She helped me design the look for our reception and it came out STUNNING!! I will never forget running around the showroom with her, looking at options, being overwhelmed, but being so relieved after experiencing Colleen’s knowledge and expertise. Also, her vision for our ceremony chairs was more than we could have dreamed up on our own. 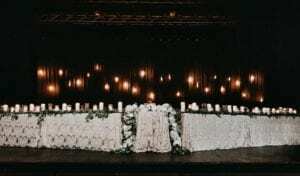 Unbelievable all around – would recommend to anyone that needs anything at all for their special day – chances are Luxe Event Linen can deliver!!! LUXE Event Linen is a Bride’s DREAM! From the genuine, customized just for you customer service to the vision worthy grand finale of your wedding reception, they nailed it. I cannot express how thankful I am for Colleen and her team. Every single detail of my wedding (and my Bridal shower) came to life thanks to LUXE. I would highly recommend if you want your dream wedding to come true. The team at Luxe are a dream to work with – look no further for your linen, chair, charger, pin lighting and decorative draping needs! I hired Luxe for my wedding and could not be happier with how my vision came to life. My experience from start to finish was first class; Luxe are always willing to accommodate with special requests, and truly deliver top notch customer service and onsite professional personnel. Luxe provide high quality rentals, detailed invoice revisions, punctual install and pick ups and competitive pricing. You will get exactly what you book with Luxe – perfection in all areas. Rest assured that this IS the right linen company for your upcoming event needs!! We’d love to hear about your Luxe Experience!